[Radu Motisan] Has entered a cool project into the Best Product portion of this year’s Hackaday Prize. It’s called an Open Source IoT Dosimeter. 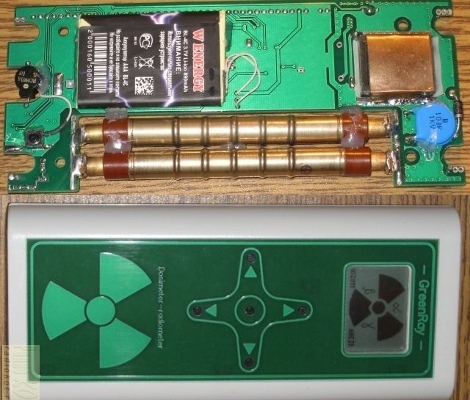 It has a Geiger tube for detecting radiation levels along with Internet connectivity and a host of other goodies. Dubbed the KIT1, this IoT dosimeter can be used as a portable radiation detector with its Nokia 5110 LCD as an output or a monitoring station with Ethernet. With its inbuilt speaker, it alerts users to areas with excessive radiation. KIT1 is a fully functioning system with no need for a computer to get readouts, making it very handy and easy to use. It also has room for expansion for extra sensors allowing a fully customized system. The project includes all the Gerbers and a BOM so you can send it off to a PCB fab lab of your choice, solder on a few components, and have a fully functioning IoT Dosimeter. you don’t even need the LCD or the Ethernet; you can choose which output you prefer from the two and just use that allowing for some penny-pinching. This is a great project and who doesn’t need an IOT Dosimeter these days? This is a multifunction too for measuring radiation (translated). The measurements center around gas discharge tubes that react when ionizing particles pass through them. After reading about the counting circuit for the pair of tubes used in this handheld it’s easy to understand why these are tricky to calibrate. The handheld features a real-time clock as well as a GPS module. This way, it can not only give a readout of the radiation currently measured, but can record how much radiation exposure has accumulated over time (making this a dosimeter). An accompanying dataset records the location of the exposure. An ATmega128 drives the device, which is composed of two separate boards, a series of five navigation buttons, and a salvaged cellphone LCD for the readout. The translated page can be a bit hard to read at times, but there’s plenty of information including an abundance of schematic breakdowns with accompanying explanations of each. This is certainly feature-rich and we think it goes way beyond the type of device that Seeed is trying to develop. With all the talk of radiation in the media today [freddysam] posted a quick Instructable about using standard camera film as a radiation dosimeter. Film is sensitive to other forms of radiation other than visible light, and high speed films are even more susceptible due to their chemistry, which has caused all sorts of headaches to travelers before most people went digital. This uses that headache as a simple way to see if you have been exposed to abnormal amounts of radiation in a 3 step process. Get some film. Yes they still sell it, it can still be found just about anywhere. In a dark room unroll a little out of the metal can and put it back in its black plastic container. Develop it if you think you have been exposed. The idea is to let a few frames of film to be exposed to normal background radiation and develop it so you have something to compare with in the future, then you can unroll a bit more, and if you think your going into a hot area you can develop that newly exposed film to see roughly how much more radiation there was, maybe helping you sleep better at night.